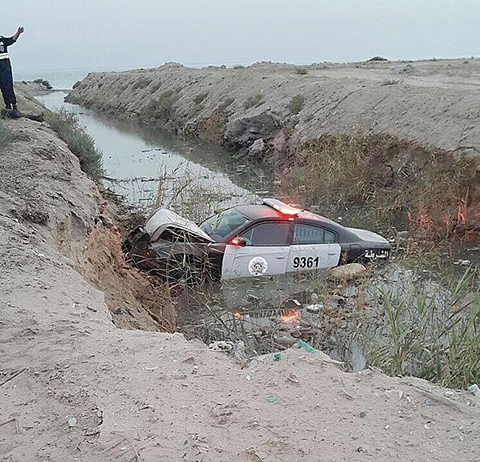 KUWAIT: A police patrol vehicle was heavily damaged in an accident at the Sheikh Zayed reserve in Doha. The incident took place when the patrol car was following a sports-utility-vehicle (SUV) in the area, but the driver refused to stop and headed to a sandy area near a popular cafÈ in Sulaibkhat. The patrol car’s driver was surprised by a large water-filled ditch and the car fell in it, but the SUV driver avoided it and escaped. Two policemen were injured in the incident. They were removed from their vehicle by people who were at the scene. Paramedics took them to Sabah Hospital. Jleeb and Ardhiya fire centers responded to a blaze in a Firdous house. Firemen evacuated the house and cut the power before successfully tackling the blaze. Two firemen were injured and taken to hospital. Avenues mall security men broke up a fight between five Gulf nationals and a citizen. Three of the men involved in the fight were drunk. A security source said the fight started when one man confronted another because he felt he was staring at him in a provocative way. The suspects were taken to Andalus police station for further action. An Indian man fell to his death while working at Shadadiya University. Separately, a Syrian man died when he fell from his residence in Jleeb Al-Shuyiukh. Both cases are being investigated by police.